A fun-filled action packed day at the Minnesota State Fair. Welcome to Governor’s Fire Prevention Day! The Twentieth annual “Governor’s Fire Prevention Day” will take place on Friday, August 24th, 2018, once again bringing the fire safety message to over 100,000 people in a single day. It is a fun-filled, action-packed event, offering opportunities for families to learn about fire-safe behavior, fire prevention, safe escape from a fire, as well as technological improvements in burn treatment and firefighting equipment. 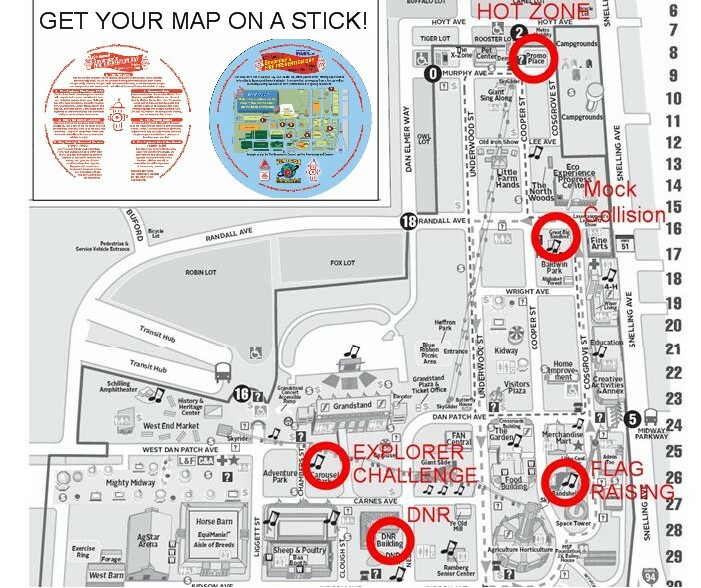 Visit us in the “Hot Zone Experience” for a chance to learn life saving skills in a fun and interesting way. Use the Safety Hopper and the Safe Escape House, see a live kitchen fire demo, and check out the latest technology on firetrucks, tools, and in training. Climb up on antique trucks and operate an old hand pumper! Enjoy the many exciting exhibits that have valuable lessons and gifts for all. A “MUST DO” for you and the family on your day at the Fair! Dan Patch Park is the home of the Fire Explorer Challenge and hosts the Dan Patch Park Stage all day. Come watch the Explorer posts from around the state square off in a competition of many different difficult fire ground activities. 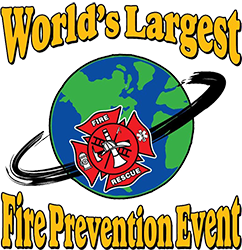 On the stage there will be many acts and skits throughout the day, as well as a Fire Prevention Report from Fire Service Dignitaries, and possibly our Governor of Minnesota himself! Fire Explorers manage the scene of a motor vehicle collision and use many tools and techniques to free victims in the same manner as the pros do. Led by adult mentors throughout the year, these young men and women learn all the skills necessary to have a firm understanding of the job of the firefighter. Here they will demonstrate their skills, cutting away cars to access their patient, provide medical care, and release the victims to the ambulance service for transport. Very cool to see, don’t miss it! The Minnesota Department of Natural Resources has a definite interest in fire prevention and has several fun interactive games that help the young and old better understand how to prevent wildfires. Test your skills and knowledge for prizes and visit the Fire Tower. Who knows, you may even spot our old friend Smokey Bear! SHARE YOUR TALENTS – VOLUNTEER TODAY! Thank you for your past and future efforts in fire prevention! At Governors Fire Prevention Day you will join a group of todays most talented and insightful public educators the world has to offer. This is your chance to engage the public and share a message that may save a life! Simply follow the registration form and bring your smile to the Great Minnesota Get-Together! The odds say that 1 in 5 Minnesotans will experience a fire in their home at some point in their life. Those are not good odds for survival without a proper education. We have more than 900 ambitious and intelligent volunteers ready to help you learn all that is necessary to prevent a fire and how to react appropriately should you find yourself in one. And they know how to make it fun and entertaining as well!! Come out and enjoy all the MN State Fair has to offer, and go home a smarter and safer person! See you at the Fair!!!! Featured at the Leinie’s Lodge, the daily flag raising will be conducted on this day by the MN Fallen Firefighter Memorial Association and the MN Fire Service Pipe and Drum Team. Singing our National Anthem this year will be the one and only “Sonic Tol Fa”! In a rich and moving display of pride and tradition these groups will capture your heart with their sparkle and shine, and leave you remembering the importance of each life claimed by fire. Listen to todays top Fire Service and Public Safety officials as they report on the fire problem in Minnesota. Take a moment to understand the impact fire has on our lives here, and how we can protect ourselves from it. This event is hosted by the Governors Council on Fire Prevention and Control, and our own Governor Dayton of MN will be here to share his perspective if at all possible. Enjoy watching the young people of our communities step up and perform as real firefighters would at a motor vehicle collision. This demonstration shows the use of tools such as the jaws of life, and shows the knowledge these Explorers have attained in extrication and emergency medical care. Don’t miss this! Watch the famous MN State Fair Parade which on this day includes a modern fire engine, an antique REO Speedwagon fire engine, and our very own Colorgaurd! Come cheer on the Explorers as they hold their final elimination competition. The event wraps up at Dan Patch Park with the awards presentation and pictures with the stars of the day…our MN Fire Explorers!